The sciatic nerve is a large, thick nerve in the body that runs from the spinal cord through the buttocks and down the back of each leg, dividing into two branches at the knees. 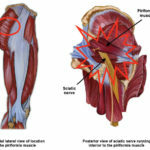 Its role is to control leg and foot sensation and enable these areas to function properly. Sciatica occurs when this nerve is irritated in some way, resulting in some very uncomfortable pains and sensations in the buttocks and down the legs and feet. Sciatica is usually due to pressure on nerves in the lower back, which might happen because of a pinched nerve, arthritis, a herniated disc, injury to the piriformis muscle in the lower spine that connects to the thighbone, or age-related lower back degeneration. It can also occur during pregnancy for some women. Long hours of sitting and putting pressure on the buttocks can sometimes result in temporary sciatica, or to numbness in the legs and feet. Symptoms may include pain in the buttocks and / or down the back of the leg towards the foot, numbness in the legs, pins and needles, or loss of normal use of the legs and feet. If pain occurs it can be burning, dull, or sharp, with some people likening it to a toothache – not a pleasant experience! The pain may also be intermittent or constant, depending on the individual case. 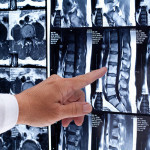 Severe cases of sciatica may result in some degree of disability. 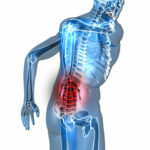 Sciatica may resolve itself over a short period, or it may linger for a long time without relief. Even if it does resolve itself, you might be left in constant pain in the meantime and looking for some quick relief! Over-the-counter or prescription pain or anti-inflammatory medications may provide temporary relief, but are not the best longer-term solution. There are a number of more natural treatments that may help ease the pain of sciatica. We have listed some of these below. Chiropractic works by applying gentle adjustments to the spine, which can in turn help relieve tightness and pain and help improve movement and flexibility, potentially making it a very effective natural treatment for sciatica. According to a 2010 study in the Journal of Manipulative and Physiological Therapeutics, chiropractic care was shown to be effective in 60% of the subjects that had not been able to find relief up to that point. This appears to have been due to the treatment providing better mobility and reducing inflammation, and as such facilitating the body’s ability to recover naturally. Remedial-type massage may relieve sciatica by loosening tight muscles in the lower back and buttock area of the body. Remedial massage goes further than relaxation massage, as it involves taking a full assessment of the client and applying suitable treatments for the problem. Examples include trigger point therapy which is used to apply pressure to the irritated areas, ‘cupping’ which goes deep into the tissues to reduce inflammation and to improve circulation, and myofascial release to improve muscular pliability. This treatment is a form of acupuncture and involves inserting small needles into trigger points associated with injuries and pain. This treatment may bring about considerable pain relief for a sciatica sufferer. Bed rest may not be the best option for sciatica, at least not for long, as the muscles will begin to weaken after a while. Gentle sciatica stretches can help to improve strength, flexibility and blood flow, and may help to relieve pain, especially when combined with other treatments such as spinal manipulation and remedial massage. Yoga exercises may be beneficial as they can strengthen the muscles and improve flexibility and posture, all of which may bring about pain relief. Pilates exercises provide another option, as they are designed to correct poor muscular tone and improve core strength and stability. Swimming and water exercises may in some cases be recommended by a therapist for a sciatica sufferer. Natural treatments for sciatica will only really be effective in the long term if done with the co-operation of the patient. This means you may need to make some adjustments to your lifestyle where possible. Examples include improving your standing and seated posture, taking warm baths, using chairs with good lumbar support, moving around more and sitting less during the day, and sleeping on a mattress with good back support. If your job requires you to sit for long periods, getting up from your seat and doing some light simple stretches and maybe going for a walk around the office or outside may help to prevent a recurrence of sciatic pain. At Hands On Health Care, we don’t just automatically apply the same treatment therapies for all clients. Instead, we conduct a full assessment of their condition and level of pain and tailor a treatment plan to suit. This may include chiropractic care, remedial and sports massage, dry needling, heat/cold therapies and / or prescribed exercises, depending on the client’s need. Contact us if you would like to know more.